At last, everyone’s favourite supercute-psychiatrist-turned-sociopath, Harley Quinn, has returned to the screen in Suicide Squad: Hell to Pay, a sorta-sequel to Batman: Assault on Arkham, in the sense that it boasts the same basic premise*, devilish sense of humour, and grindhouse-y gore as the earlier flick, as well as sharing several lead characters… though they are voiced by a totally different cast here, and there’s no real continuity or narrative connection between the two straight-to-video flicks (or the live-action adaptation, for that matter). Regardless, it’s a rollicking ride, and easily earns a place on the (literal or digital) shelf beside its predecessor. 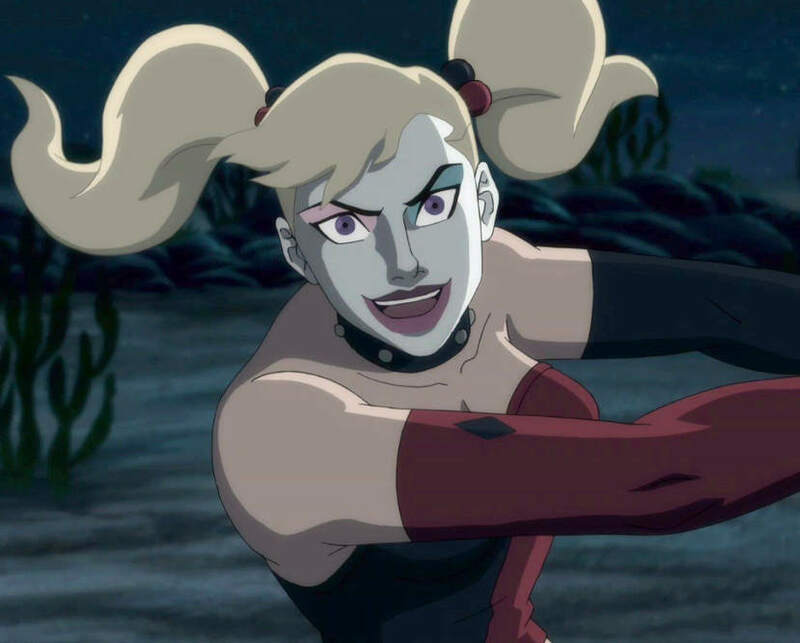 Harley, voiced by the ever-adorable Tara Strong, is sadly reduced to a supporting “comic relief” role here, but she makes the most of her limited screentime with some fun visual gags, and sparky one-liners. Other featured female characters included badass boss-lady ‘Amanda Waller’ (Vanessa Williams), sapphic super-villains ‘Scandal Savage’ (Dania Ramirez) and ‘Knockout’ (Cissy Jones), the awesomely goth-y ‘Silver Banshee’ (Julie Nathanson), plus fellow “squaddies” ‘Jewelee’ (Nathanson again) and ‘Killer Frost’ (Kristin Bauer van Straten). The latter looked unnervingly like ‘Ice’ from Justice League International, to my eyes, with her white-blonde-bob and blue/white costume… there’s also a joke about Jewelee biting Harley’s style, and I admit I was a little confused when she first appeared here too, though the character actually made her comic book debut way back in 1967, via Captain Atom (S1, issue #85), a full 25 years before HQ popped out of a cake and into our hearts! Despite this bevy of tight-bodied beauties, I applaud the movie’s equally-exploitative “eye” for spending as much time fixating on manly flesh (and prominent packages) as it does on old-fashioned T&A, thanks to a major subplot involving a male stripper with a significant “tramp stamp”…! * A gang of condemned super-villains are conscripted into completing a do-or-die mission for a shady and unforgiving government agency. This entry was posted in Rants about Comics, Rants about Films and tagged Amanda Waller, Assault on Arkham, Batman, Captain Atom, Crystal Frost, Dania Ramirez, Gothiness, Harley Quinn, Hell to Pay, Ice, Jewelee, Julie Nathanson, Justice League International, Killer Frost, Knockout, Kristin Bauer van Straten, Scandal Savage, Silver Banshee, Siobhan Smythe, Suicide Squad, Tara Strong, Vanessa Williams. Bookmark the permalink.